News and updates on Africa RISING projects in East, West and Southern Africa. Download a print version – or sign up to get Matters ARISING in your mailbox. On 24 September 2013, the first Africa RISING learning event kicked off at the ILRI campus in Ethiopia. The annual learning event aims to facilitate learning from ongoing program-wide activities (research framework, M&E, Communications etc. ); discuss project-specific methods, approaches and problems as well as interesting innovations, approaches; discuss specific sub-themes in more detail and prioritize wider program activities for the next 12 months. The next learning event will be in Tanzania, most likely in September 2014. Check out the incredible wealth of tools and approaches being used across the program. Following a program-wide event on M&E, Ewen Le Borgne reflects on the position of Monitoring and evaluation (M&E) in the program so far. In early November, over 400 delegates gathered in Kigali to discuss advances in ICTs for agriculture. Read Simret Yasabu’s take away messages for Africa RISING. Each year Africa RISING commissions a journalist to visit a project country looking for stories, results, images and impacts. In October 2013, Charlie Pye-Smith traveled to selected project sites in Ghana to understand and document the challenges and solutions emerging. Read his three blog posts ; See his photos ; watch his photofilm. The next trip will be in September to Ethiopia. Participatory research approaches demand a level of engagement and commitment from farmers that researchers need to respect. This document provides some guidelines that will help to avoid negative relationships between researchers and farmers. The main aim of these guidelines is to help build a coherent identity and presentation of program activities across all the regions. During the recent East and Southern Africa review and planning meeting, we asked Asamoah Larbi (IITA Coordinator of Africa RISING for West Africa) and Tom van Mourik (team leader for Mali at ICRISAT) to reflect on the work done by the three site teams in the East and Southern Africa region. See what they observed and learned. The 2013 review and planning meeting of the East and Southern Africa (ESA) project took some important steps towards integration of the components. In September 2013, more than 60 people came to hear progress in the ESA districts of Babati and Kongwa-Kiteto in Tanzania and Dedze and Ntcheu in Malawi. 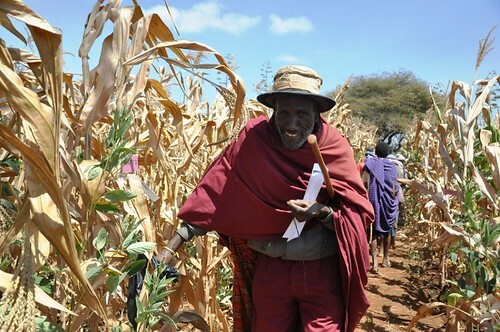 In Tanzania, farmers are active participants in Africa RISING crop trials. “I like variety 5. The cob has many rows and the grains have filled the cob well. There are also two cobs on the maize stalk,” Esther Liberati, 43-year-old farmer in Babati district in Tanzania, explains her number one choice from a set of 10 different types of maize being tested for adaptability to the region. This is after she painstakingly accessed each of them, feeling the weight of the cob and even counting all the grain rows to make her selection. Climbing beans are turning out to be one of the winning innovations being introduced by Africa RISING in Babati district, Tanzania. The beans have tendrils which coil around supporting stakes or strings and can grow as high as 2 meters and produce many pods and leaves. The Africa RISING team in the Ethiopian highlands held a review and planning meeting in Addis Ababa from 30th October to 1 November 2013. The meeting aimed to review project progress and results, synthesize ongoing diagnostic work and agree outline work plans for 2013-2014 and general responsibilities of partners. Around 45 participants representing government partners from the local to the national levels, CGIAR partners and Africa RISING team in the Ethiopian highlands attended the meeting. The International Potato Center (CIP) has been carrying out an on-farm research demonstration in all the eight Kebeles where the project is working. The purpose of this on-farm research is to demonstrate improved crops with improved management practices, and to document lessons and challenges for future consideration. Three different crop types (wheat, faba bean and potato) with three improved varieties of each and improved agronomic practices (row planting, fertilizer and pesticide application) are under on-farm demonstration and evaluation. Africa RISING’s research component (3) focuses on market value chains. The Ethiopia team working on these issues met to review the work plan for market and value chains in the project. They also discussed the tools to be used to collect relevant data and information. Local knowledge is proving a valuable starting point in adapting Ethiopian farming systems to climate change and ensuring greater productivity to combat food insecurity. 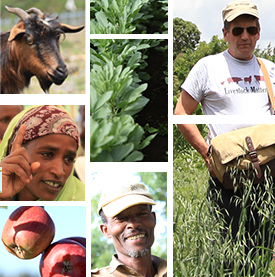 This brief by the World Agroforestry Centre analyses what farmers in the highlands of Ethiopia currently know about ecosystem processes and the interactions between trees, crops and livestock. The aim is to use this information to guide interventions that will build more intensive and climate-resilient systems. A key part of the Africa RISING communication strategy is to really engage with and document the knowledge and experiences of the communities where it works. Alongside more classical research communication, the project is therefore exploring multimedia formats like video, photographs and ultimately radio and mobile phones as tools to enrich multi-way communication. “When I was young, we used to get eight or nine bags of maize per acre,” says Abukari Iddrisu. ”Now, I’m lucky if I get three bags, and this year it will be even less.” Farmers like Abukari know that the food and farming crisis in his region has been largely caused by factors unrelated to changing patterns of rainfall. “As the population has risen, we’ve been forced to practice continuous cropping and our land is now exhausted,” he says. “The loss of soil fertility is the main reason why our crop yields are so poor.” And it is one of the main reasons why there are such high levels of poverty and malnutrition in the savannas of northern Ghana. Abukari and his fellow farmers believe that Africa RISING can help them to restore their degraded lands, increase crop and livestock production, and provide them with better incomes. 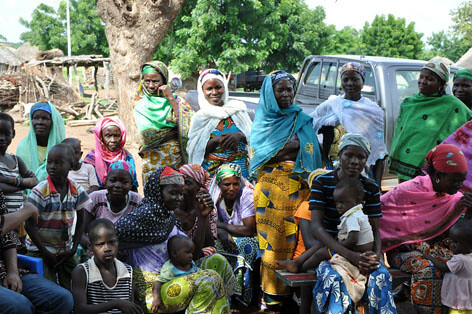 The Africa RISING program seeks to provide pathways out of hunger and poverty for smallholder families, and especially women and children, through the process of sustainable intensification. This involves producing more crops and livestock from the same piece of land, without degrading the natural resource base, thus generating more food and higher incomes.